Thanks for Being There and Welcome Home! To assist its members and their families in times of distress and to provide them mutual understanding and support; and to participate in and support veteran's functions and programs. 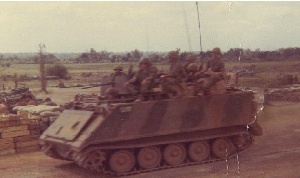 M113 APC the vehicle of a mechanized outfit. Place mouse cursor over a ribbon to see its name. This site is maintained as a memorial to those who have served and are serving with the 2nd Battalion 22nd Infantry. It consists of stories, anecdotes, photographs and the memories provided by unit members. While every care has been taken to present accurate information, we cannot guarantee that inaccuracies will not occur. The Website, Board of Directors and the Web Administrators will not be held responsible for any loss, damage or inconvenience as a result of any inaccuracy or error within this site. Because this site describes in detail events that occured in wartime, some of the content may be of a graphic nature and not suitable for some viewers. Viewer discretion is strongly advised. Neither the Website, Board of Directors nor the Web Administrators will accept liability from those viewers who find the content objectionable. Personal accounts submitted to the website reflect the memories and opinions of the individual author and not of the Website, Board of Directors or the Web Administrators. Submission of new material relating to the history of this unit is welcomed and encouraged. However, the Website, Board of Directors and/or the Web Administrators retains the right to edit any submitted material for content, grammar, relevance, accuracy or any other reason. The Web Administrators also retain the right to revise the content of the website at any time. The content on this site is protected by all applicable copyright laws. No material may be copied, downloaded, stored or otherwise duplicated by any means from this site without the permission of the Website Administrators, or Board of Directors. Copyright © 2002-2018, by Vietnam Triple Deuce INC.
Requests for Correction to Website errors or content removal (for any personal data) should be emailed to the Web Administrators or using the contacts located on the Directors Page.